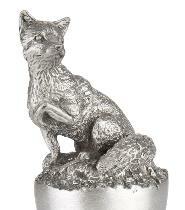 Fox Bottle Stopper, made from some of the finest Pewter in the world. Expertly created by hand this piece has a matt finish, showing off the fine detail of this animal. Makes a great gift for anyone who needs to add a little something different to the top of their bottle, comes boxed.